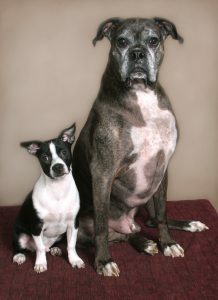 Different Dogs, one big and one little together in a portrait? For sure, and the truth is it is one of my favorite pet portrait combinations. Dogs, like people have different personalities. Sometimes they are friends and sometimes well, not so much. But no matter, it is still my objective to capture the dogs in poses that show their size difference and and also to keep them nice and close together in the portrait. Here is where the loving dog parent(s) come in to play, they are my ‘wranglers,’ my helper that help position and even pose the dogs according to my exact directions. Pet portrait sessions generally are fast paced and often a lot of activity going on while the portraits are being taken. With my experience of having photographed more than 1000 dogs and my split second timing and the way I use all my various attention getting noise makers, I am able to capture cute portraits like this one. I am now in my 38th year in business and there is nothing I enjoy more than creating pet portraits and portraits of people with their pets and I am truly honored to do so, especially when the pets are senior pets.